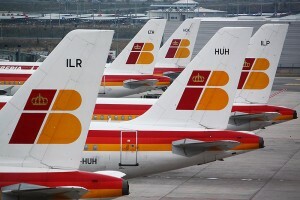 Iberia tailfins in the colors of the Spanish national flag. Iberia has kept its traditional livery after merging with British Airways. Spain continues to be a popular tourist destination for many, and if you are looking for a good deal on a trip to this country, then you should certainly consider focusing your attention upon cheap flights to Spain. Many travel agents are able to advertise short trips to Spain for a low cost because they know how to get the best deals from airlines, but with the opening up of the travel world to those who want to book their own trips, it has also become possible for the individual to find cheap flights in and out of Spain. The first thing that you need to decide is whether you want to book your flight early, or wait until the last minute. Many experienced travellers actually have a fear of waiting until the last minute to book the flight, because their previous experience has shown that you need at least 2 weeks to fully arrange a flight. In addition, if you book more than a fortnight before the flight, you are likely to be able to make some serious savings on your business. The other way to make great savings is to take a risk, and book right at the last minute. If you are desperate for a quick holiday, but still want to save money, then this can be a great way to keep your costs to a minimum, although you will have to consider whether you have enough work flexibility to take the risk with booking a last minute flight. If you want to make serious savings on your trips to Spain, then you will also have to be very flexible about how close to the holiday city you are prepared to get. Spain has a number of airports, and so if the one that is closest to your city is not offering a reduction, then you may be able to get one on another city close by. Although you may have to drive for an extra hour or two when you land, choosing to go to a more distant city can save you lots of money on flight fares. You may also want to talk to your travel agent or an advisor about the kind of flight you are willing to accept. Some countries, particularly those in Europe, offer a direct-flight service to Spain, but for other countries there are other options, such as a layover. These are inconvenient for most passengers, but could allow you to get more money off of your flight charges. As an alternative way of saving money, you might look at departing for your holiday on a slightly different date. People do not realise that shifting the departure by one day can help to change the price of their flights, but it is the case that booking a flight in the middle of the week costs considerably less than doing so on the weekends. You may be able to increase the savings from your ticket by choosing this strategy, along with the others described above.